We work with parents and students to assess if a student is suitable for a place at All Saints. If you are interested in applying for a place at All Saints during the school year, please contact the Academy Office in the first instance by telephone or email. 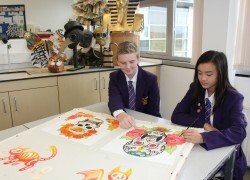 All Saints students follow a curriculum which starts in Year 7 and progresses through to Year 11. This means that Option Choices are chosen by the end of Year 8 allowing students, from the beginning of Year 9, to begin their GCSE and BTEC courses. Some subjects enter all students in Year 10 for their online examinations and the aim from September 2017 is for all BTEC courses to be complete by the end of Year 10. This makes in-year transfers more complicated for Key Stage 4 students coming from other schools. You will need to complete an application for a place at All Saints Academy. The application form is available electronically on this page or as a printed copy from the Academy reception.